Scoot over Stephenson South! Stephenson East opened in 1969 when a number of us met on the sixth floor and enjoyed similar activities and experiences as you. We too have shared life’s milestones in similar fashion over the years in large groups, in small combinations, and throughout the years in several locations. 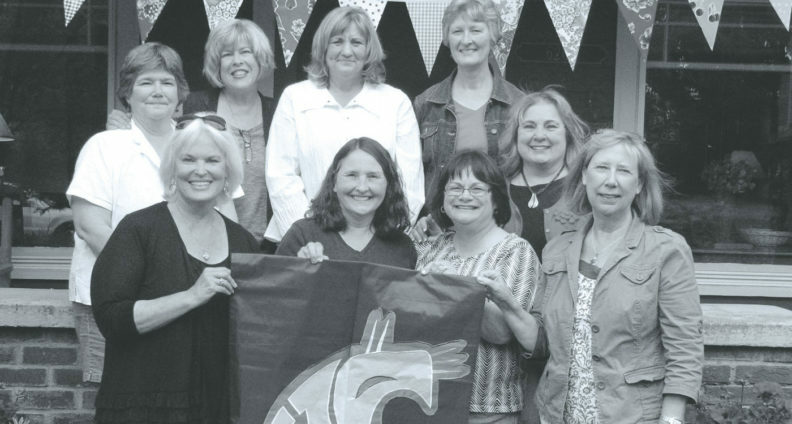 We will be twelve strong when we return to Pullman in August 2019 to celebrate the 50th anniversary of Stephenson East’s opening and 50 years of friendship. We have already made arrangements to return to the Stephenson complex and the sixth floor for a tour. We have you beat when it comes to the longest-running continuous alumni meetup! It was the fall of 1967 at WSU, and I was in my first semester of classes. As I trudged up the famous Pullman hills to my Tuesday 8 a.m. class, I could feel the tightness in my right leg. When my Appaloosa Arab filly unceremoniously dumped me five weeks ago, it resulted in a walking cast until the day before I left for college, and even then the doctor was reluctant to remove the cast so soon. The doctor cautioned me to elevate the foot at night and keep it warm at all times. Thus, I now climbed the hills in pants and knee-high boots—definitely not the required campus female wear which did not allow pants and usually consisted of a sweater set and skirt generally accompanied by nylons and flimsy pumps or ankle-height snow boots depending on the weather. I had been given a special dispensation that allowed me to wear pants all fall and winter. At three o’clock, classes over for the day, I began my descent toward the dorm and two hours of study time before I would clean up and put on the required dress for dinner; my dispensation did not include dinner. I was always exhausted when I returned to the dorm on Tuesdays and so at first did not see the notice attached to my door—but others had already seen it, including my good friend across the hall, Sharon. “Well, what have we here?” Sharon asked with a big grin as she sauntered into my open doorway. I was just emptying my bag to get it ready for Wednesday and so still did not see the notice. The gist of it: I was to be in detention for the next two weekends—never mind that one of those was homecoming and I would be having company—for my failure to adhere to the dress code. “But…but…I have a dispensation letter from admin…and a doctor’s note…” I spluttered. Several people began to speak at once as the crowd in the doorway grew and oozed into my dorm room. I tried to sort out the plethora of comments but, in my state of anxiety, had trouble focusing. A firm grip on my arm caught my attention. “Fight it!” stated the person who clasped my arm. “Get a petition going and get everyone to sign it—which won’t be hard as we all hate the no pants on campus rule. Then go before the dorm board and present the petition,” said the resident advisor. “One step at time,” stated the resident advisor. Three days later, I stood before the board with my petition in a trembling hand and looked out over the crowded audience. Many floor members plus more students from other floors were tightly packed into the meeting room. All of us waited expectantly while the regular business of the agenda was discussed. Finally, it was our turn—and I say our as it had been a team effort all along, from the resident advisor who suggested it to the petition name-gatherers to the many students who helped formulate the wording for the petition and the board presentation. And we won! The no pants on campus rule was abolished. In the troubled times to come, with campus unrest, Vietnam, the draft lottery, etc., this event might go almost unnoticed. But it was a huge step forward for females in a time when gender equality was rarely discussed. And it also was a legacy that I shared with my daughter when she too attended WSU. Do you have any thoughts on magazine articles? Reunions, weddings, births, retirements, anniversaries, or other announcements you want to share? Let us know.